Story: The makers of "Ice Age", and comedy giants Jim Carrey and Steve Carell, bring to life Dr. Seuss' beloved "Horton Hears A Who". An imaginative elephant named Horton (Carrey) hears a faint cry for help coming from a tiny speck of dust floating through the air. 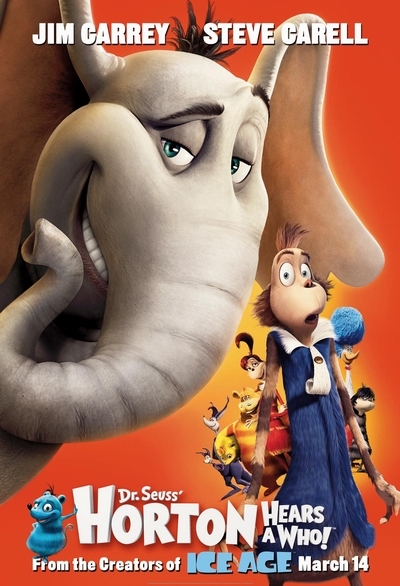 Although Horton doesn't know it yet, that speck houses an entire city named Who-ville, inhabited by the microscopic Whos, led by the Mayor (Carell). Despite being ridiculed and threatened by his neighbors who think he has lost his mind, Horton is determined to save the particle ... because "a person's a person no matter how small."